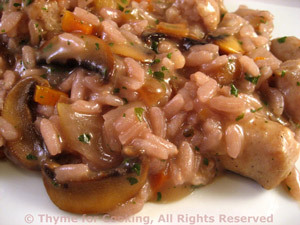 Sausage, Mushroom and Red Wine Risotto, Thyme for Cooking main course. This has a heartier flavor than typical risotto, made with red wine and beef stock. It stands up well to the sausages and mushrooms. Heat beef broth and keep hot over low heat. In medium saucepan heat oil over medium heat. When rice has absorbed most of the wine add a 1/3 cup of broth, stir. When broth is almost absorbed add another 1/3 cup and continue adding 1/3 cup at a time and stirring. Before the last 1/3 cup taste a few kernels of rice. They should be just 'al dente' - slightly resistant to the tooth but fully cooked. If more broth is needed add it 1/6 cup at a time and waiting until almost completely absorbed. Cut the sausages into 1" (3cm) pieces. Sauté sausages in nonstick skillet over medium heat until browned and cooked through. Remove. Add onion, carrot and sauté 5 minutes. Add garlic, mushrooms and sauté until mushrooms are nicely browned. Turn heat to low, return sausages to skillet, stir in oregano, cover and keep warm until needed. Note: I normally use all or almost all of the broth.